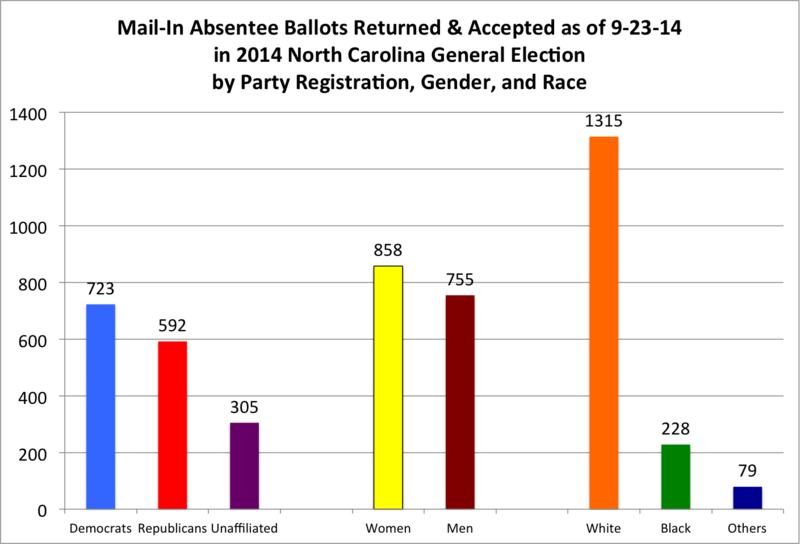 With the latest data file from the NC State Board of Elections, 13,648 North Carolinians have requested mail-in absentee ballots for the 2014 general election, with 1,622 (12%) of those requested ballots returned and accepted as votes in for the general election. As with previous analyses, the trends continue to be in the favor of registered Democratic voters. With these latest figures, registered Democrats continue to be a plurality in both requested and returned & accepted ballots: Democrats are 42% of the requested ballots, and 45% of the returned & accepted ballots. Registered Republicans are at 35% and 37% of requested and returned/accepted ballots, while registered unaffiliated voters are 23% and 19% of requested and returned/accepted, respectively. 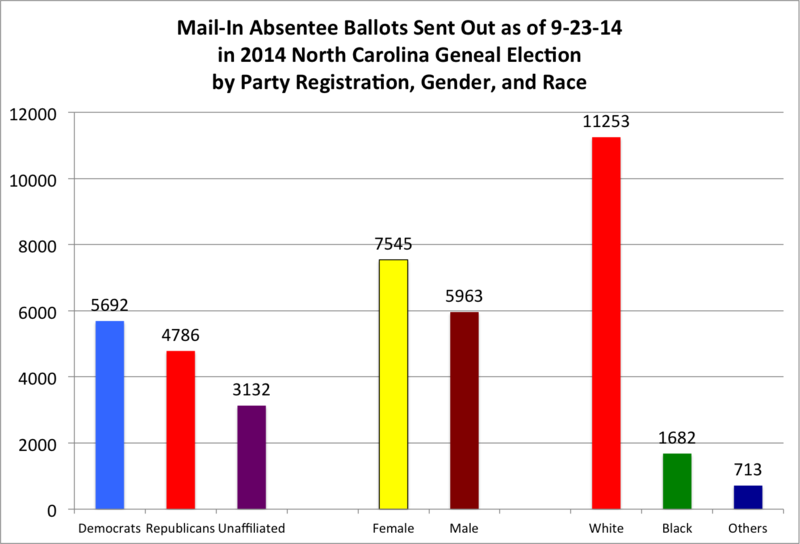 Women continue their pace of requested ballots at 55%, while being 53% of returned and accepted ballots. White voters are 83% of requested and 81% of returned/accepted, while black voters are 12% of requested and 14% of returned/accepted ballots. 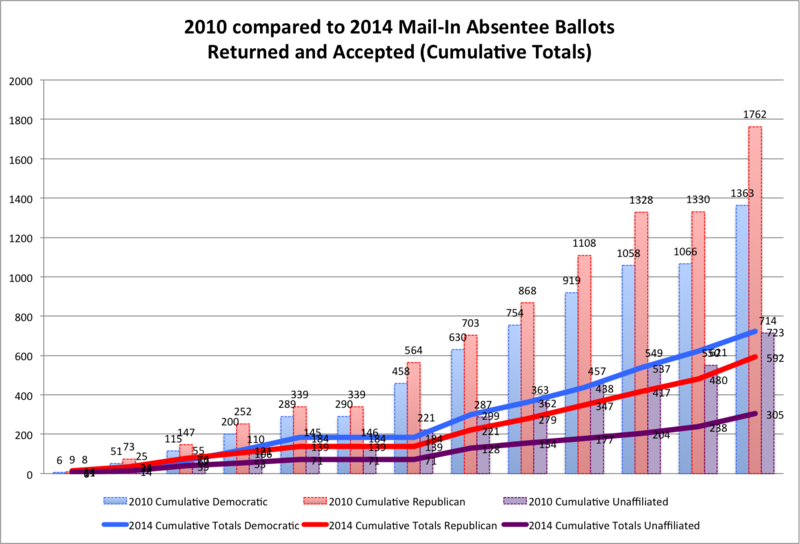 In comparison to the 2010 mail-in absentee ballots, this year's overall numbers are below 2010's, but Democrats are still leading in returned/accepted ballots over Republicans, which was the opposite from 2010. From these very early (and I stress, very early) figures, it would start to appear that Democrats are mobilized in their potential grassroots operation in an area that has traditionally been dominated by Republicans.